When last we met, we all watched as the Daytona 500 caught fire, and ESPN was pushing Boston's chicken and beer leftovers on you. What would this week bring? It's Manningsanity! : Even though everyone knew the Colts would release Peyton Manning, ESPN spent 32.25 of the 61.25 minutes (52.7 percent) on Tuesday's SportsCenter discussing the roster move. Manning helped move the NFL to the second-most discussed league, ahead of the NBA, and only behind college basketball. The 35.5 minutes of NFL content on Tuesday was the most dedicated to a single sport since the NFL received 60 minutes on Super Bowl Sunday. Along with the implications on what Manning's release meant for both him and his former team, SportsCenter interviewed NFL figures like Jerry Rice and Steve Young (who went through similar situations with the 49ers) to provide perspective on what Manning's emotions were post-release. The most incredible part of the Manning coverage was that 187 of his 191 mentions this week came on the Tuesday, Wednesday, and Thursday shows. 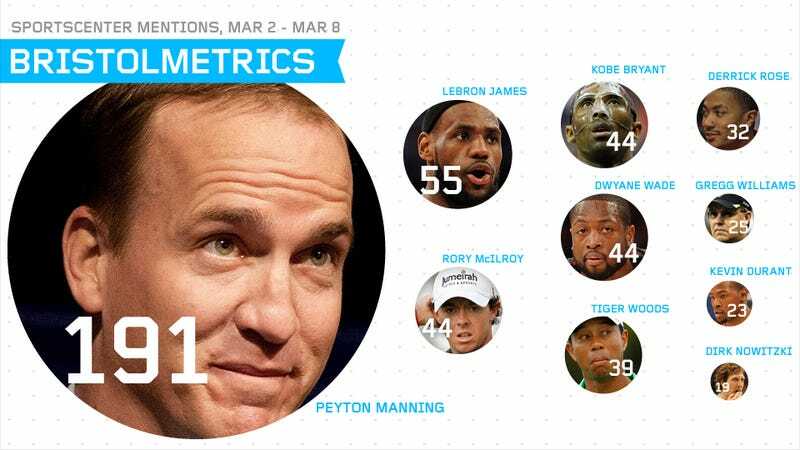 For those three shows, ESPN mentioned Manning at a rate of .932 times per minute. For comparison, Jeremy Lin was mentioned .925 times per minute from Feb. 10-16. ESPN also produced got three different career montages of Peyton's career as a Colt, one of which was a psuedo-editorial from anchor Neil Everett about why Peyton Manning means so much to fans. Here's a line from the piece: "[Manning] became the king in a state that had once been ruled by a Knight." By the way, if Peyton Manning ends up signing with the Broncos, you should just probably just avoid ESPN for the next week afterwards, unless you hate yourself and want to hear about Tim Tebow being disrespected. Bountygate was only discussed for 18.25 minutes this week: While that's more coverage than the NHL and MLB received together, this is a pretty big story, one that you usually see the network give us any new information they have on it. Some reasons for the lack of coverage are the fact we're in the middle of conference tournaments for college basketball, and Peyton Manning's release took up a significant chunk of time this week. And then there's the issue of getting on the wrong side of the NFL and the NFLPA, both of whom ESPN has very special relationships with. Until Bountygate fines and suspensions are announced, we won't hear too much more on the issue, barring a major development. Danica Patrick finally makes a top 10 in 2012: Patrick becomes the first woman to make the top 10 in SportsCenter mentions one week after cracking the top 15. Even though Patrick has had a bad start to her 2012 season, she still brings more people to the sport, who therefore will watch more NASCAR on ESPN. If you ever needed proof that ESPN cares about name recognation, Denny Hamlin, the racer who won at Phoenix last Sunday, only got 11 mentions during the week, compared to Patrick's 19.